* Off white cotton look label printed in BLACK text. * Size: 15mm x 50-70mm. * Very easy to sew by hand. Tuck under ends and sew down. * Print 1, 2 or 3 rows of text. No Icons. * Print up to 22 letters per row. 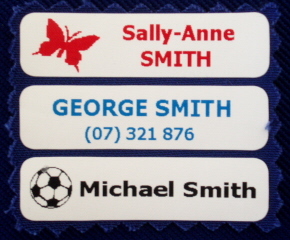 * White Label printed in a choice of Red, Blue, Black or Pink Text / Optional Icon. * Size: 12mm x 50-70mm for 1 row of text / 15mm x 50-70mm for 2 rows of text. * Easy to sew / Fray ends tucked under and sewn down /Nice to wear against the skin. * Print up to 16 letters per row with an icon or up to 22 letters without an icon. 'Peel off backing paper, Position & Press' on to Clothing. * White Label printed in a choice of Red, Blue, Black or Pink Text. * Size: 12mm x 46mm. * Fast and easy to apply with rounded egdes - no hard to press corners. * Print 1 or 2 rows of text. Optional Icon. * Print up to 14 letters per row with an icon or up to 22 without icon. letters without an icon. 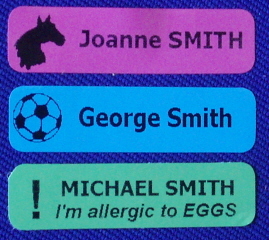 * Easy Peel & Stick coloured labels in a range of colours - see chart. * Dimensions: 12mm x 46mm. 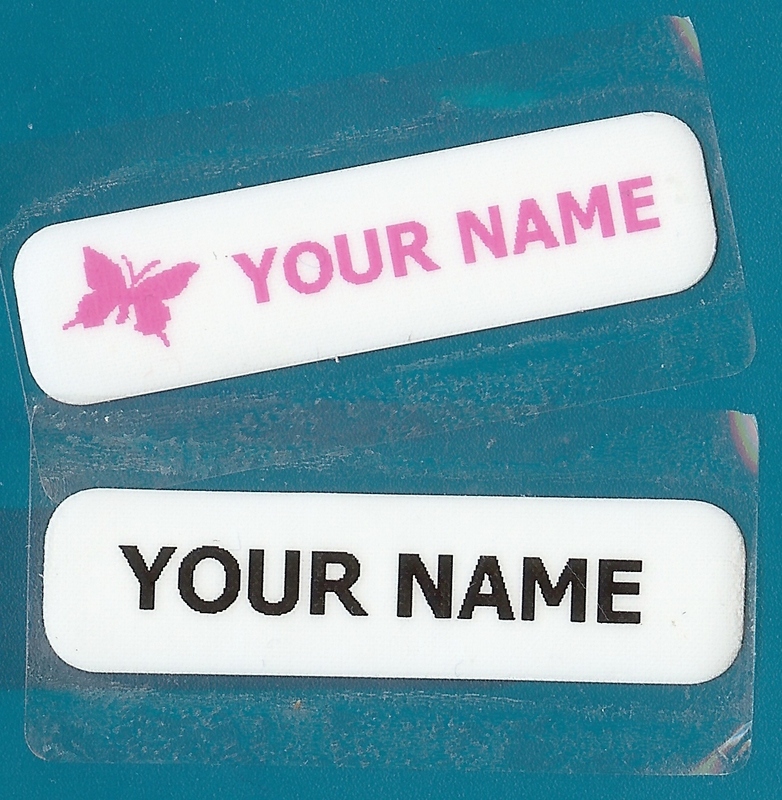 * Soft & pliable labels wrap easily around washable property items. * Wash by hand or in dishwasher. * Print up to 14 letters per row with an icon. * Place label on inside arch of shoe. * Cover with laminate covers to protect label inside the shoe. * Print up to 14 letters per row with an icon or up to 22 letters without an icon. * Minimum order: 5 pairs per name. 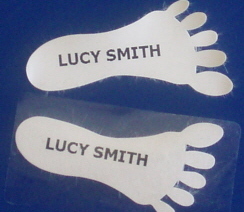 Sticky Feet Labels - Great fun for kids shoes! 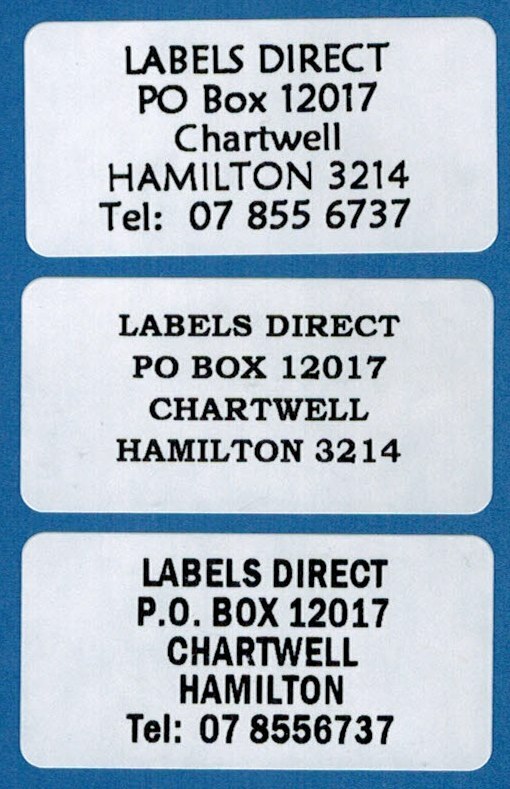 * White labels printed in black text only. No icons printed. * Dimensions: 10-20mm x 43mm - supplied in left and right pairs. * Cover with laminate cover to protect the label inside shoe. * Print 1 line of text only - up to 18 letters. 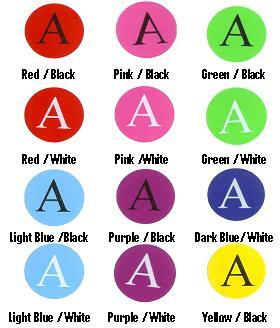 * See Picture of white gloss labels for fonts:. Please outline your labelling requirements. 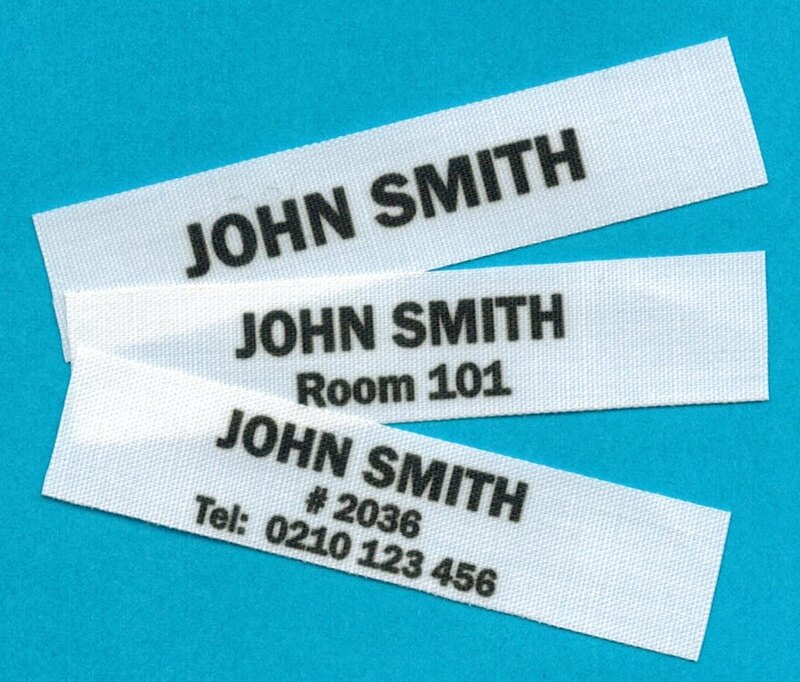 Please include details of Label Type, Label Colour, Print Colour, Icon (if requried) and Text to be printed for each set of labels. 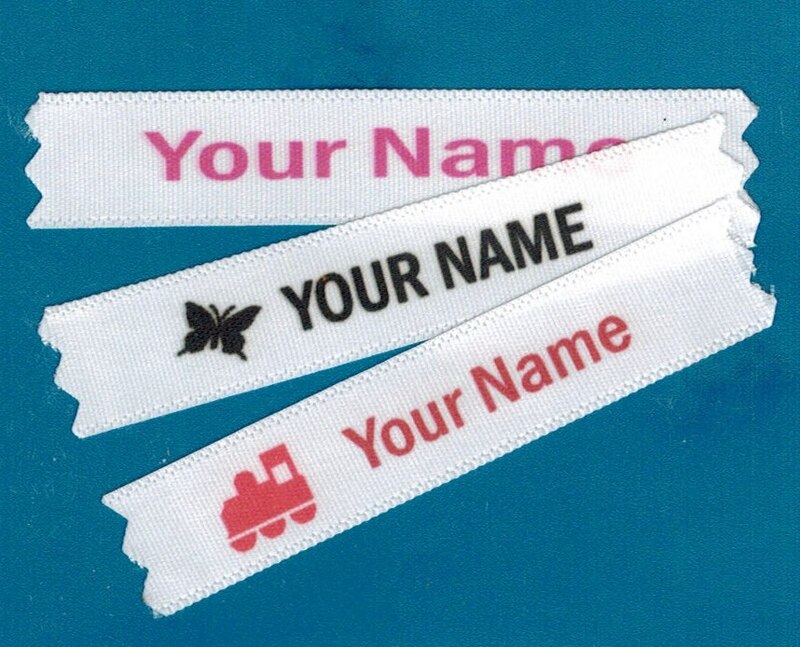 All labels will be sent by courier, add $8.50 for courier or $11.50 for RD courier. A Order Confirmation will be emailed back to you. This email will include payment information and confirmation of dispatch times. A confirmation of your order will be sent by email to confirm we have recorded your order correctly. BANK TRANSFER: - Our Bank details are emailed or texted to you along with order confirmation. DISPATCH TIMES: Target dispatch from our office is within 7-14 working days of payment clearance. Over public holidays and business holiday periods, delays will be expected. Courier Post Delivery Delivery main towns and cities within New Zealand by CourierPost is currently 2-4 working days. $11.50 is charged for delivery to RD addresses - current delivery is 1-3 working days. GST is included in pricing. An icon can be added at no charge. 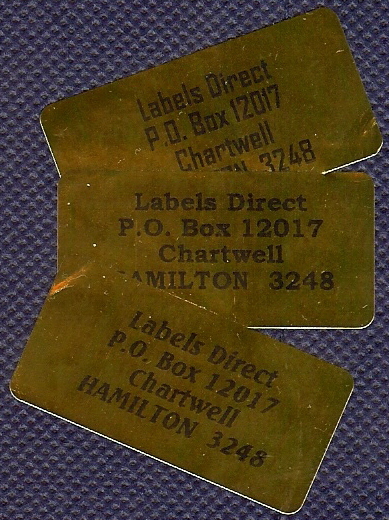 Packs are priced according to label type and quantity required.